I am redecorating my house! Wow, what a fun job this has turned out to be. I have lived in my house for 25 years and have not spent much time or money on new furnishings or finishes. We have fixed things that have broken, repaired things when needed, and replaced appliances when they died. But this year we are doing a MAJOR remodel and putting in new floor coverings -- carpeting, rugs, and kitchen and bathroom floors. It was about time. I was tired of pink carpet. Ok, it was sort of mauve colored, not really bubble gum pink, but while I like pink as a color, I was not fond of it in my living room, hall, bedrooms, stairs, kitchen, bathroom. . . .etc. You get the idea. Now it is officially gone, and the new carpet is a very soothing light bluish gray that makes me feel peaceful. I love it! The dining room is a beautiful wood planking and a new round rug sits under my table and chairs. New curtains hang on the patio door leading out to the back porch. So, with new carpet, I had to get new curtains and sheers for the windows, new shades for the lamps. and new flower arrangements for the living room. 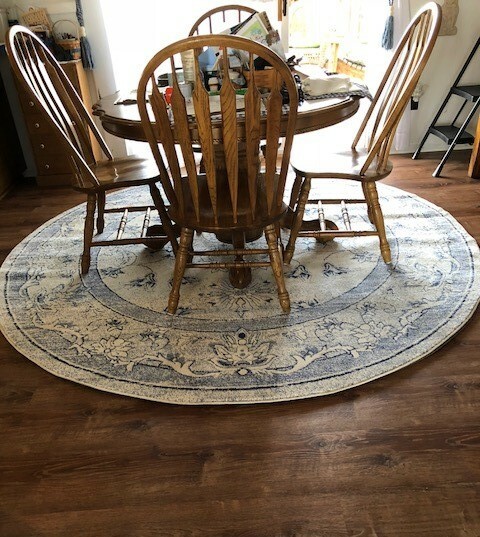 And because my large screened-in back porch is such an important part of the house in the spring and summer, I felt it needed updating and got all new rugs, seat cushions, and plants for it. Wow, it is looking really nice. I am not much of a shopper but I have enjoyed scouring the internet to find just the right pieces for my house redo. Where are the pictures you ask? Uh, it is still so stinking cold here in Kansas that I left the plastic on the new cushions until I am sure the snow and rain are mostly over. We have snow in the forecast for Easter so the covers are staying on for a few more days. When the covers come off I will post some pretty pictures of my newly refurbished back porch. Other new things in my life are 2 new patterns I just published. Hot off the presses are Eye on the Sky and Golden Garden. Both patterns are now available on my website and fabric lines are shipping to shops around the country. Both are made with the new lines from Banyan Batiks by Northcott. Golden Garden is cut out using the AccuQuilt Winding Ways die for the GO! Cutter. The gentle curves are really easy to sew and the quilt can be cut out in an hour or so with the Go! Big. I upgraded to the electric Go! Big and love love love it. 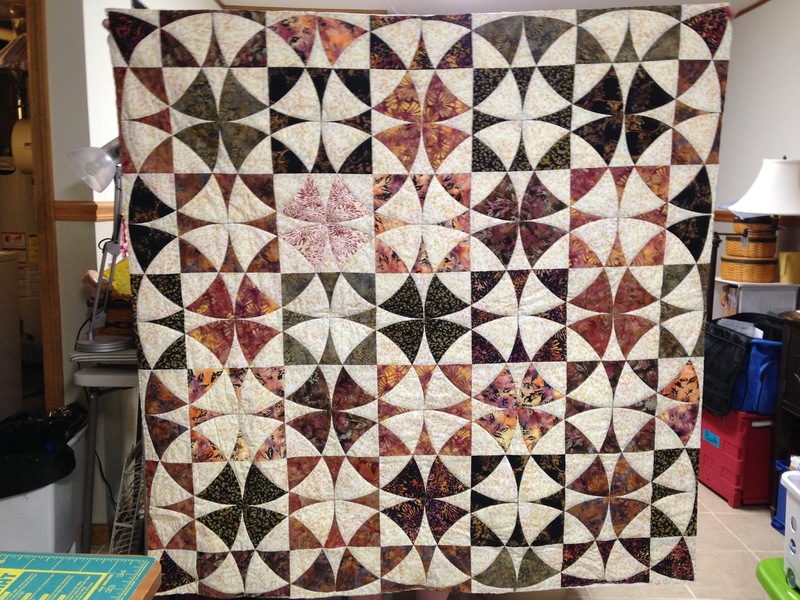 The completed quilt is 48" x 48" and makes a great throw size quilt or a large wall hanging. Eye on the Sky is foundation pieced, which makes those points crisp and accurate. A pretty wall quilt made using Banyan Batiks Ketan Multi collection. 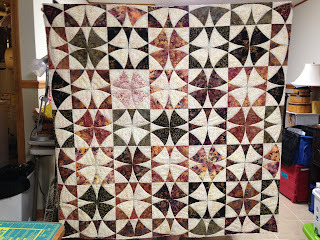 And of course, the Starburst Blossoms Free Block of the Month for April is now available to download. Just click on the 2018 BOM Tab at the top of the Blog page to download the free block. Want the free bonus block? Subscribe to my newsletter and get the bonus block exclusively from a link in the newsletter each month. Only subscribers get the secret link to download the bonus block for free, and only for 30 days. The newsletter is sent out on the first and fifteenth of each month. So if you sign up after April 1 you can still get the link on the 15th. Of course you can purchase the block all month long on my website. Past blocks and bonus blocks are available as well. Coming soon. . . I just finished writing the pattern for Chilly Nights, and the fabric ships this summer to your local quilt shop. Tempted? Nancy's Notions will be carrying kits!! Panels are really hot this year and many of the lines I am designing for have panels featured in their collections. While I am not a big Polar Bear fan, I love the blue colors and textures in this collection named Northern Solitude. I will be vending so stop in to see what's new. "Want the free bonus block? Subscribe to my newsletter and get the bonus block exclusively from a link in the newsletter each month. Only subscribers get the secret link to download the bonus block for free, and only for 30 days." Ladies - does this answer your question about the bonus block? THANK YOU for that explanation! I didn't realize you sent other emails in addition to your "newsletter" email. I'll keep my eyes open for the April 15th newsletter email. Thank you!